Richard Stamp is always up for a challenge. The affable Enchant, Alta. seed farmer has taken cracks at many projects over the years. 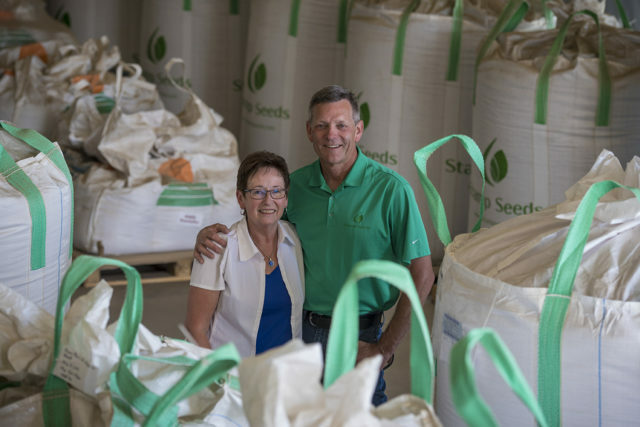 With four decades of peaks and valleys, he and wife Marian have successfully navigated Alberta’s complex farm economy and have now transitioned the farm to the next generation via a razor-sharp business model. 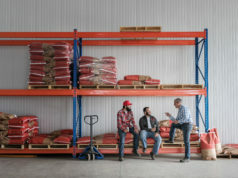 The first big challenge he accepted was in 1979 when he decided to get into farming by purchasing two quarter sections of land from the Alberta government for $100,000 thanks to a beginning farmer loan program. Shortly after, he reconnected with high school classmate Marian Huvenaars at a social event and the duo later married in 1980. In 1979, interest loans were nine per cent, with a three per cent kickback if you had an adviser to assist you. Oil was below $6 and wheat was above it. However, the minute land base and Marian’s off-farm job as a teacher was what protected the Stamps from going belly up less than five years after the farm’s genesis. “The only saving grace was that we were on our own. We were pretty small, and we didn’t want to give up,” says Richard. “I don’t know if we were lucky, or had a vision, but I didn’t want to quit. I’m not going to quit anything.” Refusing to make a quick exodus from agriculture, the Stamps kept plugging away, despite self-imposed austerity measures for years to come. A crop enthusiast at heart, Richard decided to part ways with his animals and after conversations with mentors Leonard Haney of Iron Springs and Tony Crooymans of Bow Island, decided to move into pedigreed seed growing by 1985 starting with 50 acres of Galt barley. The winds of change began to blow, and the farm started to inch toward prosperity. “At that time, it was important because we wanted to market more of our grain in a different way. As a very little farm, I wasn’t trying to market our grain to the CWB, I was trying to make a bit more of a profit and putting more effort into our few acres,” says Richard. Pedigreed seed farmers received an exemption under the Wheat Board, which was a bonus – it diversified the farm operation and avoided the board. The farm slowly expanded from two quarters to 1,100 acres by the late ’90s. The family’s entrepreneurial spirit and perseverance was on display as they weathered the wild ride of the ’80s that put many western Canadian farmers out of business. Their perseverance and commitment to bettering the farm was recognized beyond the farm gate, too. In 1997, two individuals who weren’t familiar with one another nominated the Stamps for Alberta’s Outstanding Young Farmer, an annual prize awarded to the province’s top farm, based on many criterion, such as innovation, community building, future planning, the farm business model and sustainability. Richard thought they picked the wrong people and Marian was likewise shocked at the nomination news. There was no error when it was announced the Stamps had claimed the Alberta prize. Later that year at the national level, they were co-winners of the countrywide award. 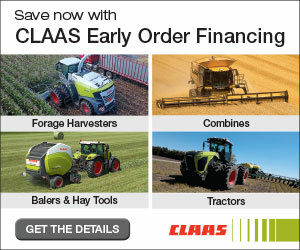 Winning the awards once again helped shape their lives and farm. 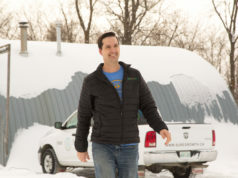 “What it did was challenge us again to think about ‘what’s your business model; what are you doing; and why are you doing it?’ It really honed that for us,” says Richard, who would later serve as president of Canada’s Outstanding Young Farmers Program for two years. By 1998, things had begun to clip along at a profit annually. The pedigreed seed business was a year-round operation that always had challenges that Richard embraced. The shift back into retail sales had helped the farm generate more predictable income throughout the year. The same year the Stamps were acknowledged as Canada’s Outstanding Young Farmer, Richard had an opportunity to grow GMO potatoes from Monsanto and he once again rose to the task. However, the equipment, time and capacity required to take care of the spuds was very demanding. Around that same time, a wave of anti-GMO fervour began to spread and it made marketing the spuds near-impossible. In many ways, he was back where he started in the ’80s, living day by day and with a scaled-back approach to farming. However, it once again allowed the family to re-examine its business commitments and shift gears back to strictly sales and seed production of crops – and ditch tubers once and for all. “What surprised me [was] we went through a lot of hardships, but it’s how you deal with those challenges, or anything in life. It’s how you look after those challenges and responsibilities. Hopefully that’s been a guide for our family,” says Richard. It wasn’t long after the farm reorganization that the Stamps were finding new opportunity, this time from one of their four children. In 2005, 22-year-old Greg was wrapping up his agriculture degree from the University of Lethbridge and had a chat with his father. Greg had always helped on the farm during busy times. However, now, he was beginning to feel like the farm may hold something more for his young family. Despite the catch-22 conversation, Richard and Marian embraced Greg’s family into the operation and the oldest son began to work feverishly in those early days to help expand the farm, refocus on retail sales and do just about anything to make the farm life work. If it sounds as though it were a lot of work, that’s because it was. Greg stuck with it, though, and things began to turn around with a focus on seed sales and production that helped sprout renewed optimism. As the father and son began to gel and learn each other’s work rhythms, Richard was dreaming up ideas with fellow seed farmers south of the Trans-Canada Highway. They were all after the same thing: help one another out, but also leverage their buying power, marketing abilities and form partnerships with larger groups. “We travelled together quite a bit to grower meetings, and we talked about it for a couple years. ‘How do we help each other build our businesses and focus on this?’” says Richard. In 2010, SeedNet was born: a 14 family conglomerate ready to grow and market any seed crop that would have a guaranteed end market. Since beginning, they have collectively grown more than 750 combined crop types and varieties – from conventional CWRS wheat to chicory to quinoa, SeedNet has tried almost anything you could think to plant. Today, as 13 families, they boast a cumulative 50,000 acres in production and grain storage exceeding two million bushels sustained through 13 retail outlets in southern Alberta, as well as other locations in Saskatchewan and the U.S. The buying and marketing opportunities they sought had been achieved, as well. The Stamps always maintained a variety of pulses and one crop they own the rights to is AAC Lacombe, a yellow pea variety with excellent resistance to powdery mildew and a sure stand. As well, FB 9-4 faba beans have also been a strong variety for them in recent years. Through SeedNet, they’ve proven that bigger can be better. Two years ago, the group was awarded the rights from German seed company KWS for its fall rye variety Guttino. They also work with AGT Foods and the Crop Development Centre at the University of Saskatchewan to grow, market and retail varieties they have rights to. As Stamp Seeds continued rolling along and expanding with more farmland, there was yet another expansion on the home front. Greg’s younger brothers, Matthew and Nathan and their families, returned to the farm operation in 2010 and 2012, respectively. Matthew, whose schooling included a business management and a bachelor’s in accounting, focuses on all construction projects, seed treating and logistics in the yard all while working closely on the books. Nathan, who also earned an agriculture degree, oversees the crop production, equipment, maintenance and the farm’s HR department. Daughter Aimee farms with her husband Blake Klatt near Foremost. With three brothers in the mix, it was also the right time to start talking a formalized succession plan that included all three. In late 2017, after more than two years of work, the family inked the final agreement: each son is now a one-third owner with an agreement to take care of Richard and Marian into retirement and beyond. From 300 acres 39 years ago to now more than 6,700 acres, expansion has been vital to the farm’s generational transfer, refined business model and ability to bring on a three-way ownership agreement. Today, the company has 10 full-time employees and runs year-round. Recently, they hired a full-time CFO which allowed Marian to step back after dutifully managing the entire farm accounting for more than 30 years. Today, the seed farm also boasts an on-site, pulse-specific treatment facility capable of treating in the winter. 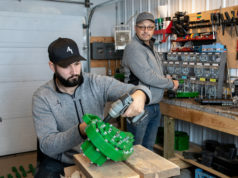 They’ve also installed an Alberta-first: a seed-cleaning machine, also pulse-specific, that features conveyor belts and bean ladders to ensure minimal drops and maintain quality handling of 13 tonnes of grain per hour. All the value-added offerings are giving a stamp of approval for 2018 and beyond.